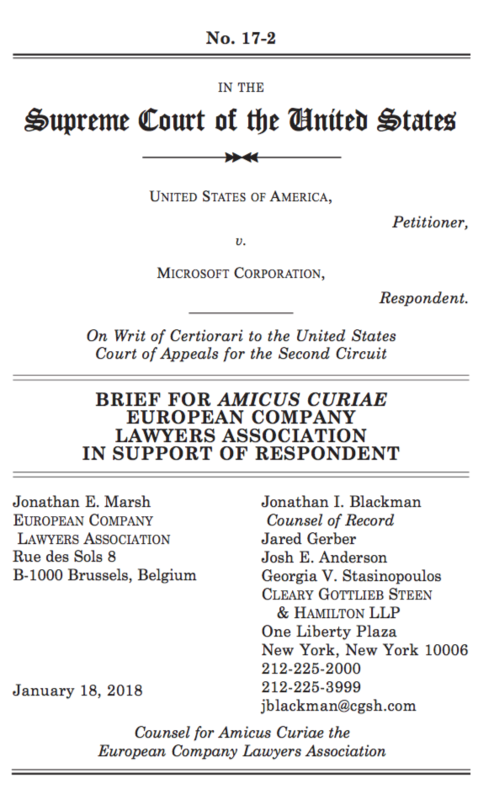 On January 18th, 2018 ECLA filed an amicus curiae brief with the Supreme Court of the United States in the case of United States of America (petitioner) v. Microsoft Corporation (respondent) in support of respondent. In the above-mentioned case, the Government’s position places European companies and other companies that do business in the European Union between the irreconcilable demands of EU and U.S. law. The Government of the United States of America seeks to compel production of personal data stored in Ireland pursuant to a U.S. statutory provision, the Stored Communications Act, 18 U.S.C. § 2701 et seq. (the “SCA”), that the Government concedes was not designed to apply extraterritorially. The Government nonetheless maintains that so long as a service provider is subject to service of an SCA warrant in the United States, and disclosure of the data would be made to authorities in the United States, compliance with an SCA warrant by the service provider is required. This position creates direct conflicts with EU data protection regulations that explicitly prohibit the very transfer the Government seeks and authorize sweeping administrative penalties and private lawsuits for violations of that prohibition. Adopting the Government’s view will all but assure that companies are trapped between two competing legal mandates, with no clear path for navigating that conflict. In-house lawyers are EU companies’ first line of defense in understanding and complying with the European Union’s comprehensive privacy and data protection requirements. The ECLA therefore has a strong interest in ensuring that its 42,000 constituent lawyers (who practice in 18 countries across Europe) and the companies they advise not be unnecessarily forced to choose between complying with a U.S. warrant for communications stored in Europe and violating the EU law that limits the processing and disclosure of those communications. You may find the full amicus curiae brief filed by the European Company Lawyers Association on the left. ECLA will continue to provide more information to its members as this case progresses and when any decisions concerning the case are made by the Court.